Satellite High School, in Brain Bowl, with the Latin Club under Helene Kansas, in various classes; after college graduation, as young analysts in New York and elsewhere. Fate has determined that you will not know your father well from firsthand, but all of us who have been graced with knowing Sameer, hope that you may gain solace in the sure knowledge that he was a fine human being, with an expansive spirit, who touched the lives of many in the most positive ways. Sameer loved life, and savored it in his allotted time, more than most who are granted many more years. He combined a brilliant and agile mind with a genuine warmth for his fellow man, and an openness to many ways of looking at the world. He carried with him an insatiable curiosity, and a razor-sharp wit, that never allowed him to pass over his experiences or broader world events without commentary, and usually, keen insight. Even in any area that was very different from his own specialized expertise, Sameer could usually capture the essential elements and provide high quality analysis of a problem, almost on the fly. But his skills of analysis and persuasion were most on display when there were many differing opinions. Sameer could disagree with you and with good humor, expose the error of your own opinions, and bring you around to accepting an alternative, better than anyone I have known. He could take everything both seriously and lightly, so if there had been consensus, Sameer could expose the underlying contradictions, and if there had been discord, Sameer could find equanimity in a way that you did not even feel bad to be giving in to his position. Or if on rare occasions a flaw in his own reasoning were shown, then he was quick and unhesitant to acknowledge that, and to adopt a new point of view. Sameer was perhaps the most unprejudiced and tolerant person I have ever met. He reveled in differing points of view, and so it was not in him to be dogmatic. That is one reason that he was a great person with which to share a visit to Jerusalem. He was equally at home by the Western Wall, in the Holy Sepulchre, or at the Dome of the Rock. He was not judgmental in his approach and had ample reserves of empathy. Sameer took time to appreciate each moment. Not only did he have a broad palate of likes and enjoyments, he helped those around him appreciate whatever they were sharing. I recall an occasion when he was an analyst doing a consulting project in Spain, and even though he was not really a skier, he met me half way at the ski resort of Grau Roig in Andorra (I was coming from France). Even though he had to work through the visit, we enjoyed the evenings sharing tasting menus of Catalan cuisine, with bold red wine, cognac, and cigars so as to squeeze every potential out of the occasion, and to wash down the laughter that always accompanied time with Sameer. Sameer was spontaneous. While never in a hurry, he could change plans and objectives in a minute, if a new and better alternative were proposed, or if circumstances dictated a change. And he would bring an equal enthusiasm to carry out the new plan to its conclusion. That made Sameer a great travel companion, because he was always ready to adjust to whatever might come along, and enjoy it just as much, as happened once on an ill-fated trip to Ascoli Piceno (a great undiscovered Renaissance hill town) that had to detour to L’Aquila. With Sameer’s base-line level of satisfaction, we all just took advantage of the treasures of L’Aquila before returning to Rome. Sameer was rich in friendships. Not only did he make new friends easily, but he took great pleasure in sustaining old friends. Sameer cultivated his relationships. At times, it seemed that he kept a giant GPS in his head with knowledge of the location of all his friends, and if his business brought him near, he would reach out to those friends in whatever locale. I regret that I let the last few years slip by without maintaining contact with Sameer, but then this summer reconnected with him on Facebook. Then, just a week before he passed away, Sameer reached out with a phone call out of the blue to share some laughter and rekindle the bond. The intervening years washed away as I heard the same rapier sharp wit and high-pitched laugh over the phone lines, as the conversation bounced from topic to topic. I recognize that phone call now as a gift that stemmed from how Sameer treated relationships: he never let time or distance stand in the way, and took the time to connect and to sustain his friendships. Sameer loved family. Even as most of his friends gradually found spouses and had children, while Sameer took a bit longer to partake of those gifts, it was always clear to Sameer and his friends that he would have a family. In the meanwhile, those of us who started sooner gained the benefit of the warm attention Sameer showered on our children. Sameer was always comfortable with children, and children responded naturally to his warmth and kindness. Sameer was a great friend, and I miss him dearly. I am a better person because of crossing Sameer’s path. I treasure his easy generosity of spirit, his open-hearted disposition, and his equanimity. While I have never met you children or your mother Surekha, I hope that a part of Sameer’s legacy for you will be the sure knowledge of the profound impression he left on so many others. 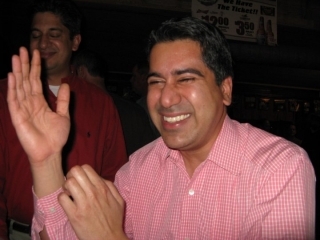 Sameer was a great man, and I cherish his memory. I went to Satellite with Sameer and had several classes with him. I’m not sure how I had ANY classes with him, as he was brilliant and I was academically average. Sameer was without a doubt the smartest person in our graduating class and quite likely the smartest person I’ve ever been lucky enough to know. While his brilliance is important what is more important is his kindness. Sameer always had a kind word and a smile on his face. He always made you feel that he was happy to see you. I am so saddened that his children will not get to grow up with him and that he left them so prematurely. My prayers are with his family. He was a good friend throughout our primary education. He smiled alot even back then, especially when he was winning. Sameer and I competed on grades all through our primary education. As seen on my handwritten 5th grade rankings, he always came out on top. The winner in Mr. Deith’s 5th grade class got to ride a small pedal car that Mr. Deith built around the school track. I remember Sameer smiling the whole way around the track. If I remember correctly the rest of us in the top 5 just got to sit in it. I remember that science project (picture in the photo gallery) that he did at Hoover. Everyone knew that Sameer would win. I remember the candy business that Josh Litwin mentioned in his remarks. Sameer and William Fitzgerald were partners in that endeavor. I believe they called their business Shah-Fitz Enterprises. You notice that Shah is mentioned first. It was a booming business that made alot of money that had to be shut down by the administration due to its popularity. In fourth grade I remember Sameer and I grading papers for Mrs. Knoll. We even competed doing that by seeing who could grade the most papers the fastest. Sameer came up with a war game in elementary school that we played on a piece of paper. First you would create a map with land and sea areas. Then you would place your artillery, tanks, and ships on the map one turn at a time. You would take shots by placing the tip of your pencil on where you were firing from and flicked the pencil back to fire. If the resulting pencil lead trace hit the enemies object then it would be destroyed or partially destroyed. This would lead to many debates as to whether your object was hit and how bad. Sameer won most of those debates. I do not remember beating him once. I came close one time but he prevailed again and smiled. Teachers would have to tell us to put the game away all the time. I regret very much not keeping in touch with Sameer after high school. Sameer was one of a kind and I realize now that you should keep people like Sameer a part of your life. Sameer and I did start to reconnect last year when he joined facebook. I was looking forward to seeing him again. I was recently thinking about Sameer and was very happy that he was doing so well in his career. I am shocked and saddened by his passing. I will always remember talking to Sameer a number of years ago in Indialantic, hearing his laugh and him saying that this real estate price increase was a bubble and it won’t last. I should have listened to him—he was much smarter than me. He will always be remembered and greatly missed. I have not talked to Sameer, Shalin, or Mr. and Mrs. Shah for nearly 30 years; however Sameer and the Shah family will always be a part of that most wonderful time in our lives when we are young, innocent, and hopeful for the future. Like cousins not seen in many years, I have never had any doubt that I could call or visit Sameer, Shalin, and the Shah family and be welcomed with warmth and hospitality. I ask myself now, under such tragic circumstances, why I waited for a such a visit. Extended thoughts about Sameer. Please write as much as you like. For the children of Sameer, I can tell you that I knew your father as a boy and as a young man. I wish I could tell you all about him and just how proud you can be of him. Your father and Shalin were a constant part of my childhood. We all played baseball together in Indian Harbour Beach, we went to Ocean Breeze Elementary School together, and most importantly, we were in the Cub Scouts and Boy Scouts together. In fact, your grandfather was one of our leaders in the Cub Scouts. You have a wonderful family, as I am sure you know. My own father is a man of very few words, and of even fewer compliments, He rarely shares his thoughts. However, one of the earliest compliments I ever heard him pay was to your father and your uncle. At the time, Sameer (known to me then as “Sam”) and Shalin (known to me as “Charlie”) and I were playing in the lowest “farm” league of the baseball program. I wasn’t much good at it and complained bitterly about it fairly regularly that I was ready to give it up. One day my father said to me quietly, “Bobby, do you know who I admire?” “No Daddy, who?” “Bobby, I really admire those Shah boys. Do you know why?” “Nope, I don’t Daddy.” “Bobby, because they get out there on the baseball field at every practice and every game and give it their all. I admire them.” That has been over 35 years ago and I still cannot forget my father’s admiration for your father and your uncle; he has few compliments for anyone. They did try very hard; while none of us went on to stellar baseball careers, I believe the three of us learned much in those early years. I remember being in the scouts with your father. When I first moved, at 11 years of age, to the Boy Scouts from the Cub Scouts, your father was already there. I was put in the lowly “Panther Patrol”, I believe your father was in the elite “Raven Patrol” with guys like Neil Kent, Mike Hock, Steve Brunton and later Josh Litwin. Our Panther patrol was straight out of the movie “The Bad News Bears,” your father and his crowd were unbeatable in scout craft and winners at everything they did. Was I jealous? You bet I was as I am sure my patrol buddies Mike Moulder and Mike Clanton were too! But your father always had a kind word for me and was a friend to me. I remember especially that he helped me get my coin collecting badge and I bought my then most precious coin, an uncirculated Roosevelt silver dime from him. I could go on and on about what a special person your father was, but I will stop here. Let me just conclude that despite the years since I last saw your father, your uncle, your grandfather, or your grandmother, I remember them with the utmost respect and appreciation. Your father was brilliant, everyone knows that, but more importantly, he was a friend, he was good humored (I never saw him angry but always smiling and joking with a razor wit) and he was faithful to his friends. I regret so much that I did not see him recently, I regret more that it is now too late. But I am blessed most with the memories that I have of my time with him and the Shah family during that most special and formative time in our lives- our childhood. I wish both of you the greatest of success and happiness in life. I know that your father is so proud of you. To the Shah family, I am so very sorry for your loss. I knew Sameer at Satellite High School we graduated in the same class. I was never as smart as he, as popular or as politically active but I knew him as a friend of some mutual friends. He was kind and genuinely friendly to everyone. I have a very clear picture in my head of his smile, so clear that I even went back through old photo albums to find it…..I guess that’s just how much of an impression he made on me that I can see him that clearly almost 30 years later. My heartfelt and deepest condolences to his family and friends. I met his dad a technical conference. When I reconnected with Sameer on Facebook last year, I told him: “I told your dad that in high school but you were my academic “hero”. You inspired me to try harder. I was jealous of your brains.” This incident reminds me of how important it is to convey to people how they positively influenced your life. Sameer is part of one of my favorite families in the whole world, the Shah Family. Sameer will be greatly missed as he was greatly loved. Those of us from Satellite Beach are well aware of how open the Shah home has always been to us. Not just the legendary high school parties, but open every day to Sameer’s and Shalin’s friends. Sameer was the older brother to my best friend Shalin. He was the older, wiser(sorry Shalin), and more mature big brother. Of course he made fun of us younger “scouts” and kids, with that classic Sameer sense of humor, which comes from Mr. Shah. I miss, as an adult, my times in their kitchen with Mrs. Shah trying to get me to eat Indian (read spicey hot) snacks and meals. Sameer always in the back ground pouncing on our rhetoric with his wit. To that point in my life I had not known anyone that dressed as well as Sameer. Whenever I see someone wearing Kaki pressed pants, striped shirt and a sweater hung over his shoulders, I think of Sameer. I remember a few years after the “Members Only” era, of him poking fun my way as I was severely tardy for that trend. And how smart and clever was Sameer. On a trip to India and Nepal in 1985, Sameer argued with a Casino/travel department over the value of “one time play” chips. So here is Sameer, 20 years old logically winning a dispute against 3 suits twice his age. While they didn’t give us additional chips, they certainly lost their moral highground. I will miss his laugh and wit the most as it reminds me of good times with him and his family. I am thankful for his friendship and am a better person for his playfully sarcastic but effective input on my life. I knew Sameer through his brother Shalin, whom I have been a friend with since elementary school. At school age, being two years younger (the age difference between Sameer and Shalin) can be huge. This never was an issue with Sameer. From elementary school, all the way through entering the business world, he always treated any of Shalin’s friends as one of his friends. As a senior in high school, he was always able to get Shalin’s sophomore friends invites to the big parties. Sameer went away to one of the top colleges, but when he came home on breaks, he would never think he was better than anyone else, even though we all knew he was. When he landed his first job in NYC, he was very helpful in giving advice for us guys getting ready to graduate from college. But most of all, I remember Sameer being his usual class act as the Best Man at Shalin’s wedding. He was Shalin’s blood big brother, but he was like a big brother to me, and Shalin’s other friends. How wonderful this world would be if we could have more people like Sameer. I am very lucky to have known him. Although I probably haven’t seen Sameer in at least 20 years, I look at picture in my office every day that he is in. This photo represents a time in my life when my friends meant the world to me. Sameer was one of those friends. Most likely one of the smartest people that I have, or will ever meet in my entire life, but also enjoyed every minute of life when I knew him. From what I hear, that never changed much as his life went on. He will be missed by many. Jenny Seekins Smith My prayers and thoughts go to the Shah family. He was a wonderful guy. Beth Bentley Bollero So sad to here this!!! 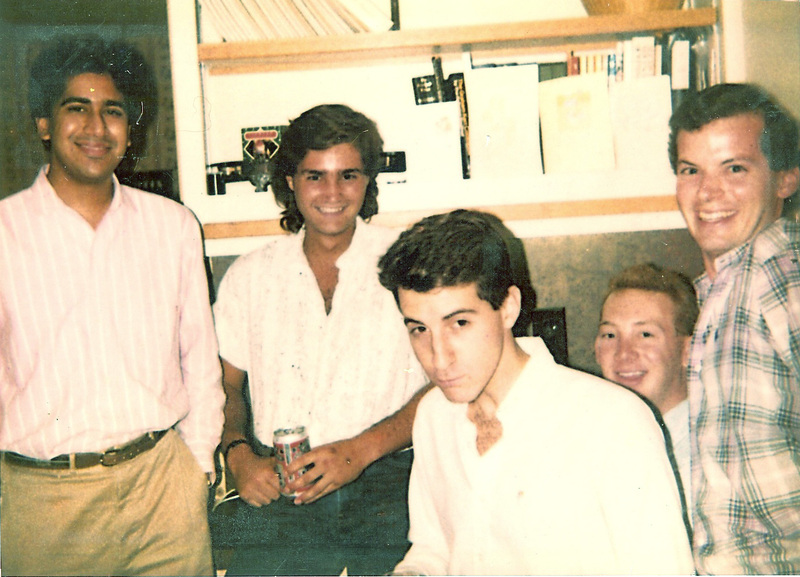 Sameer Shah was one of the smartest, if not, The smartest student in the Class of ’82. He was always very kind too. I pray for his family to find Peace in knowing what a great man Sameer was to many. Connie Hardy Jennings Proof that Sameer and Julia were BOTH smart!!!! Check it out! Wally Wallace Bill and Neil weren’t any slouches either! Craig Norheim What is that from? 6th grade? Connie Hardy Jennings I stole it from Bill Guzak, Craig! One of the most kind , funniest, smartest men I have had the pleasure to know. Journalism and speech classes would not have been the same without him. My condolences to his family. Kristen Gailey Stevens For sure… he always had a smile on his face. Terribly sad for his family. I am not sure if Sameer was at DeLaura or not. We had many classes together at Satellite and he was in Brain Bowl with me. To the outside world we may have looked like the geeks, but Sameer was always cool, competitive and sharply funny. A great intellect with a super sense of humor. He, Minna Rauhala, our friend Henry Willmore…we were always competing for grades. None of us thought we were different. I was very lucky to reconnect and see your Dad last year, still the same sharp , witty charming friend. I was very Lucky to have know him and God is lucky to have such a smart guy to help him. Although a grade behind me, his open smile, generosity of spirit and kindness left an indelible impression on those who had the privilege to know him. Because of your family heritage, he made Student Gov’t and Civic class very informative at a time when foreign relations in the US was rather heated. Yet, with tremendous understanding he explained the politics of the situation with the utmost of respect and humor. He was very brave person, who killed us with his kindness. And for the record, he was a world class debater and one heck of an extemporaneous speaker. This is what I remember about your father. This photo that Maria Makowski Franco provided sums it all up for me. Her caption was also perfect (just above the photo below). Sameer laughed pretty hard at his own stories! Which made me laugh even harder. He had a simple, pure joy when he laughed. Added to my love of him, since I knew how insanely smart and capable he was. Not many people know this, but Sameer and I had competing (illicit) bubble gum businesses in Junior High. We each bought packs of gum before school, and sold them at a mark-up during the day. It was head-to-head, we each had a set of other students helping with distribution and security (we weren’t the strongest guys, and lots of big kids knew we had gum). Without knowing it, we both wrote about the experience when we each applied to Stanford Business School. And we both got in! Sameer’s passing has hit me really hard. I more or less followed right behind him, through Boy Scouts, Hoover, Satellite and beyond. He had a huge effect on my direction. He provided me an example without which I know I could not have achieved what this life has given me. Sameer was one year older than me. He became a patrol leader in our Boy Scout troop, so did I. He became an Eagle Scout, so did I. He was in Student Govt, then president of the junior high, me too. Similar story in High School. Student gov’t, Brain Bowl captain, me too, right after him. He graduated college, became a management consultant, described it to me my senior year (I had no idea what it was), then that’s exactly what I did as my first job. When I didn’t know what to do after a few years of consulting, he told me about going to Stanford Business School. Guess what, that’s what I did too, two years after him. He and I stayed in touch through the years. When I was an aid worker in Indonesia 20 years ago, he flew all the way there to visit, literally half-way around the world. He came out to San Fran for my wedding seven years ago, and had been out here several times since. I visited his parents about 18 months ago, to introduce my children to them, and to see Surekha, and meet their beautiful children. Mr. and Mrs. Shah are really a treasured uncle and aunt to me, they are family as far as I’m concerned. The guy had a huge effect on my life, and his departure has left a huge hole in it. I’m so sad for the Shah family, especially Surekha and the children. I have seen the strength of the Shah family up close through the years, and hope their cohesiveness will give them comfort in this terrible time. Like all of you, I will miss him so very very much. Lisa Guill Maxson How terrible! This is just so sad. I remember Sameer Shah as the smartest and nicest guy in our class. I will be praying for his family. Lisa Guill Maxson ‎Jim Greene, I remember that party. What a great group of young people. Eric Moeller (I think) has pictures from the party on facebook. 1) Sameer was always laughing. Always. He had the innate sense and understanding of what was meaningful and important. And one of those meaningful and important things was to laugh when we can. He did so often–probably 100 times a day–if not more. 2) Sameer was wickedly smart and insightful. 3) Sameer was a great friend and was always sharing his gifts of humor and intelligence to those around him–especially his friends. Sameer shared great insight with a charming sense of humor–which is a rare and welcome gift. And it will be missed–but it lives on in our memories of him.